“Bangalore is a name that reeks of history, from colonial times to the 21st century. The Den Hotel is a uniquely high-tech addition to India’s capital of high tech.."
The Den, a 226-room luxury hotel is now open in the southern Indian city of Bengaluru (Bangalore). Known for its centrality to India’s high-tech industry, the “garden city” of Bangalore is also a must on many tourists’ itineraries in the world’s second-most-populous country. 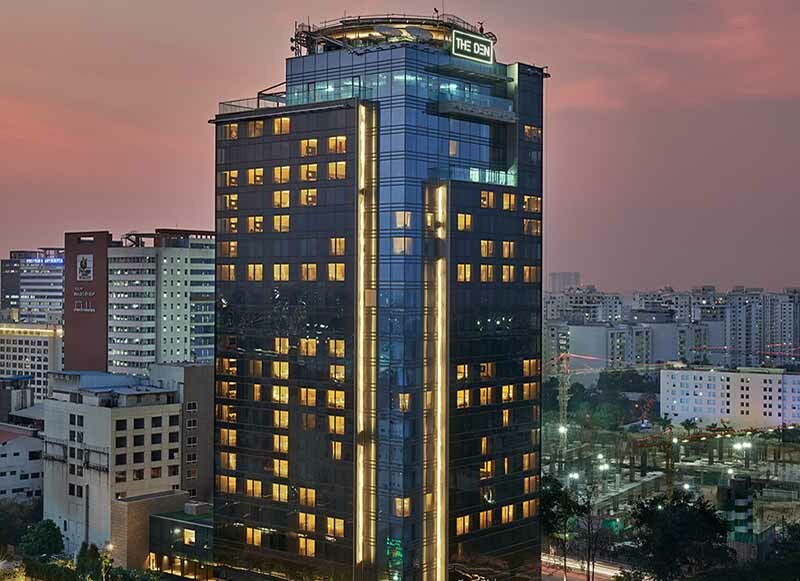 The tower hotel is located in Whitefield, adjacent to Bangalore’s wealth of IT parks and business areas. Offering spectacular views of the bustling International Tech Park (ITPL) district, it is also perfectly located for visits to sights such as the Vidhana Souda – India’s largest legislature, and the magical Lalbagh Botanical Gardens. Another plus for VIP travelers is the rooftop helipad. A variety of restaurants and bars please every taste and palate. The sleekly designed gym and outdoor pool offer guests an opportunity to decompress, as well as the property’s spa, which boasts an outdoor, lush relaxation area. “The Cave” in-house cinema recreates a sophisticated living room experience and “The Play House” offers a variety of recreational amenities, including digital table top games and pool tables.